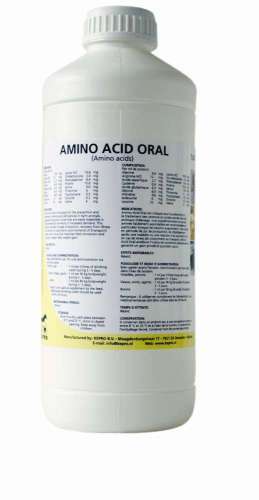 Amino Acid Oral is a liquid preparation of a well-balanced combination of essential amino acids for administration via drinking water to calves, cattle, goats, poultry, sheep and pigs. The incorporated amino acids are easily digestible. Amino acids are essential for the synthesis of proteins that are needed for growth of organs and muscles and production of milk and eggs. Amino Acid Oral is indicated for the prevention and treatment of amino acid deficiencies in farm animals. Supplementing amino acids that are easily digestible is recommended at moments of increased demand. This concerns periods of peak production, recovery from illness and reaction to vaccination and moments of (transport)stress. Amino Acid Oral improves feed conversion and ensures a higher daily weight gain. 100 ml PE-Pharma bottle (80 bottles per box).